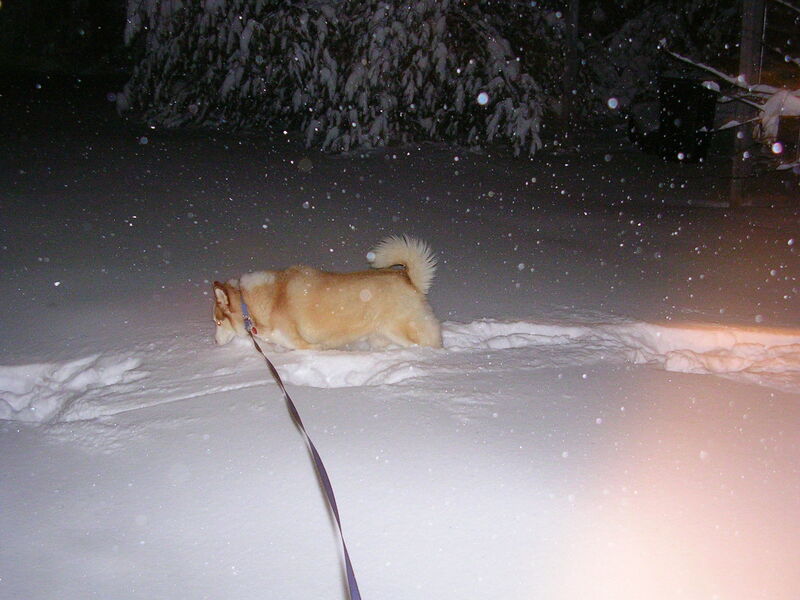 You know you are in for a trying day when it is 5:30am and the snow in the driveway is up to your huskies belly. My saving grace is that it is Saturday which means that instead of securing the dog on the porch and dragging out the snow blower and moving snow for two and a half hours, I can turn around, stick the dog in the laundry room and go back to sleep and worry about the snow later. I’m not a fan of snow, yes its pretty, but pretty is only skin deep and ugly is to the bone. Watching Sequoia play in the snow does add a whole new element. I wish I had set the camera to video mode but at 5am I am not thinking that clearly, it is amazing I had the presence of mind to grab the camera. I seriously had to laugh as she bounded through the snow, tail in the air, mouth open tongue lolling out to one side. Every now and again she would dunk her face in the snow then pull it back out totally encrusted in snow up to her ears, her blue eyes sparkling. Then she would stretch out her neck, her eyes would narrow to slits as she put her nose high in the air and breath in all the scents the world has to offer her. The next moment she would be bounding through the snow again. If Sequoia has taught me anything it is to take the time to live in the moment. It is a lesson I forget all to easily, thankfully she is there to remind time and time again. We hardly got snow here, though have certainly had our share up til this point. I think my brother who lives in Conn. got walloped with storms like most of the east coast. Is the pic with your header your house? Yup, that is our house. It is actually the front of the house and we never use that entrance. It is only the front because it faces the street. We use the back of the house for the entrance. Thanks, and yes they are great companions. Thanks for reading and glad you enjoyed. It’s crazy weather this Winter. Here in Vancouver we seem to have side-stepped Winter altogether. It’s raining less as well. We were up to 14C yesterday in the sun and the night time temperatures are also high around 7 or 8C. It’s unbelievable that this year, the year of the Olympics in Vancouver, all the snow has melted off the local mountains where some Olympic events are planned. They are trucking snow in from as far away as Manning Park and helicoptering in snow from the tops of mountains. It seems when it comes to the Olympics, cost is NO object! Hah, it makes perfect sense that the Olympics starts in five days and you guys are loosing snow. It is amazing that they are going to helecopter it in. And it is pretty sad that cost is no object when it comes to such things. I can only wonder how much they paid for snow. I remember Misty reacting that way in the snow. It really makes you appreciate nature. Here in Montreal we have had little snow compared to other years, so far. There was just an article in the Gazette that the city is saving 17 million on snow removal, so far! I don’t exect to escape for the whole winter but tomorrow is the wecond week in February, followed by March and then its April! We’re almost there! So let Sequoia enjoy the snow while she can. Jesse, thanks for that video, just saw it on face book and that is exactly what Sequoia was doing, only Maya being younger and her first big snow had a lot more energy. Both Denyce and I laughed till we cried while watching the video.